We have Brand New Hewitt Boat Lifts! 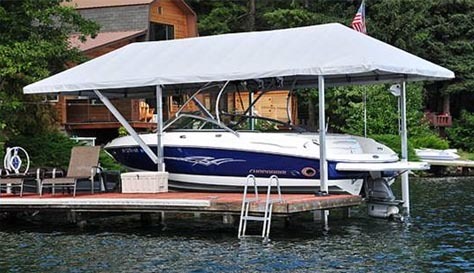 Hydraulic solar powered lift with a canopy that can handle up to an 18,000 pound boat! Over 24’ and / or over 4400 pounds please call to tell us about your boat. We would be happy to help you with Lake LBJ boat rentals. We have relationships with most of the boat rental outfits on Lake LBJ. Let us know what type of boat you are looking for and we will use our relationships to help you get the best rates available. Through our partnership with Freeride Wakeboard Schools, we can even get you a new wakeboard boat equipped with everything you will need for a day of fun on the lake including a professional driver. Please let us know if we can assist you with boat rentals or any other recreational questions you may have. Our Lake LBJ marina is centrally located on the Lake with immediate access to the main Lake. Entering our slips is easy via a 100 foot wide channel with water depths to accommodate 75’ vessels! We have a total of 20 slips available for lease that can house anything from a PWC to a large yacht. We are located immediately adjacent to a gas dock and small convenience store. Unpacking for a day on the water is as simple as driving your vehicle directly to your private parking spot which is immediately in front of your boat slips! Our guests are welcome to use our on site boat ramp at no charge. We can also help you with trailer storage, as well as winter boat storage. 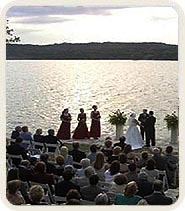 Book your Lake LBJ wedding on our private island. Call us to talk about your special day and how you can use this venue for free, and receive special event pricing on your Lake LBJ Lodging! Please contact us if you re interested in hosting your special event on the private island at Sunrise Cove on Lake LBJ. We will gladly work with you to develop a package that incorporates your needs.